Healthy Coat offers the highest quality available Omega 3 and 6 essential fatty acids so often lacking in your horse's diet! All Natural HealthyCoat® is the Total Supplemental Nutritional Package for your horses’ optimum health and “Top Performance”. Founded in 1997, HealthyCoat is an Iowa-based company that has perfected a unique cold extraction process to produce an all-natural liquid feed supplement rich in the highest quality Omega 3, 6 and 9 essential fatty acids (EFA’s). This method, using low temperatures and no chemicals, maintains these fragile nutrients and EFAs, which are often lacking in a horse’s diet. HealthyCoat’s EFAs provide a natural source of Vitamin E and Lecithin, fortified with Niacin, Biotin and Vitamin B12, which boosts optimum animal health and encourages top performance with as little as two to four ounces per day. EFAs are essential to equine health, but because horses cannot produce them naturally, those EFAs must come from an outside source. Good feed should provide most of the vitamins, minerals and proteins for your animals’ nutritional needs. However, essential fatty acids are fragile. Most dry feed is exposed to air, light, heat and processing which DESTROYS essential fatty acids (EFAs). Therefore, most animals are deficient in Omega 3 and Omega 6 EFAs. HealthyCoat provides a rich natural source of Vitamin E and Lecithin and is fortified with Niacin, Biotin and Vitamin B12. HealthyCoat’s proprietary mechanical manufacturing process uses no chemicals or heat, which can damage the fragile nutrients. Instead, it creates a highly palatable liquid supplement that is easily digested and slowly metabolized, so it will not cause nervousness or uncontrollable energy. In addition to promoting a glossy coat and healthy skin, HealthyCoat helps maintain healthy joints and addresses issues related to EFA deficiency including dry skin/allergies, laminitis, brittle or cracked hooves, inflammation, arthritis, reproductive issues and below optimum performance. HealthyCoat also provides maximum energy to muscles, and is ideal for boosting nutritional levels for animals in the often-stressful conditions of competition. Riders of all disciplines have discovered HealthyCoat. What benefits do Omegas through HealthyCoat have to offer? • Rich in Omega 3 and 6 EFAs. • Safe, all-natural source of vitamin E and lecithin. Promotes glossy hair coat; enhances skin while helping maintain hoof condition. Fortified with niacin, biotin and vitamin B12. Aids in the maintenance of healthy joints. Great for body conditions, sale, or show prep. Fed at higher rates HealthyCoat works as a safe weight builder. Easily digested and slowly metabolized-will provide a consistent level of healthy “controlled energy”. Aids in digestion and the absorption of fat-soluble vitamins, A,D, E and K.
Ideal for hot weather feeding and keeping your animal cool. Highly palatable with apple flavoring. Why should I feed HealthyCoat everyday? Good feed should provide most of the vitamins, minerals and protein your horse needs. However, essential fatty acids are very fragile. Most dry feed is exposed to air, light, heat and processing, which destroys EFAs. Therefore, most horses are deficient in Omega 3 and Omega 6 EFAs. HealthyCoat provides the richest source of mechanically extracted, high-quality Omega 3 & 6 EFAs that the horse can not produce. Plus, HealthyCoat is a rich, natural source of Vitamin E and Lecithin, and is fortified with Niacin, Biotin and Vitamin B12. Why are they called “Essential Fatty Acids” and what do they do? EFAs are essential to the health of your horse. Most of all, because the horse can’t produce these two fatty acids: they must be provided by an outside source, such as HealthyCoat.Omega 3 and 6 fatty acids are a structural component of all cell membranes, Without EFAs, the cells will substitute another type of fat, thereby creating a cell that doesn’t have maximum vitality, strength or health. What is the difference between HealthyCoat and feeding corn oil, wheat germ oil, or generic soybean oil? How much HealthyCoat do I need to feed? We suggest starting gradually increasing from 1 to 4 ounces per day for the average horse. Higher levels may be fed to active horses or horses with poor skin, coat and health needs. HealthyCoat contains 2 1/2 times the digestible energy of grain and hay. If undesirable weight-gain results, we suggest cutting back on the grain or hay rations. Shelf stability allows you to save money by purchasing in 2.5 gallon jugs, without the worry of spoilage due to the high levels of all natural Vitamin E.
HealthyCoat gives my horses extra shine and bloom. While not allowing my supplements to blow away or go to the bottom of the bucket, my horses love the taste of HealthyCoat and it helps them to eat their supplements. It works as a high fat energy source and most important, I have noticed it helps with hoof growth, which has been a big factor for me. Tried HealthyCoat for the first time when we had a horse with a coat issue. After two weeks on HealthyCoat noticed a big change. I really recommend it, it’s a great product for performance horses and any kind of horse. I personally use HealthyCoat on all my horses, everyday. I encourage all the girls, young women and horsemen to put all their horses on this product. 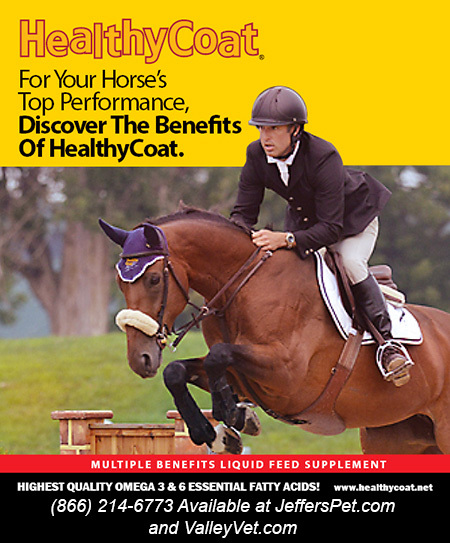 HealthyCoat is a tremendous product for all athletic horses. You’ll see remarkable results; glossy hair, supple hooves, controllable energy, more endurance, better muscle tone and less leg cramping. With just two ounces per day for one week you will get the results you are looking for. After looking at the product’s ingredients, Dr. Marcotte told us it was a good product, and we should try it. We started using the product 9 months ago, and we have seen a considerable change in our barrel horses. In our opinion the hair coat, health maintenance and stamina has improved in all our daughters’ horses. When we put our horses on HealthyCoat we saw results in a matter of only three weeks, we started seeing a big improvement in overall looks and movement. Team Steinhoff doesn’t endorse very many products, and before we endorse a product, it must be used and approved by us on our ranch in Vinita, OK. We are proud to say that Team Steinhoff Proudly Uses and Endorses “HealthyCoat”. Thanks for Everything. I was introduced to HealthyCoat a month ago. Put three horses on it and noticed drastic changes. We liked the product so much we’ve put the whole barn on it. We love HealthyCoat and give it a strong endorsement. Percheron Thunder is running on the cutting edge of high equine performance. To be at their very best, we must provide these Percheron geldings a high performance diet. We rely on products that maximize the performance and health of our horses. HealthyCoat delivers this and much more. We use to feed just a plain jane vegetable oil but since we began feeding HealthyCoat our horses thrive. We maintain a great hair coat and have requirements while keeping that healthy glow. We’ve introduced an all natural supplement called HealthyCoat to our horses. Our horses really love to eat it. We’ve noticed in our horses a shelly hoof condition, it really helped to promote a solid healthy hoof and found that it helps with a strong and flexible joint. It’s done wonders for our horses! Where can I buy HealthyCoat? HealthyCoat can be purchased online through JeffersEquine, Valley Vet, Dovers, KV Vet Supply, Livestock Concepts or refer to our website . Also, HealthyCoat can be purchased at Tractor Supply, Mills Fleet Farm, Orscheln Farm & Home, Theisen’s and numerous local feed stores. Whether your animal is kept for pleasure or competition, if there’s a need for better skin and coat, keeping on weight, better absorption of nutrients in feed, keeping overall health or regaining vigor, this naturally processed, high quality supplement, HealthyCoat with it’s Multiple Benefits is your answer. HealthyCoat, without a doubt, is the best choice for your horse’s supplemental nutritional needs.